Promptly at 1 o'clock, two Confederate cannon of the Washington Artillery of New Orleans were fired as a signal to begin the artillery bombardment prior to the infantry assault. Approximately 120 Southern cannon suddenly came to life, sending shot and shell into the Union line on Cemetery Ridge. Colonel Edward Porter Alexander recalled, "In another minute every gun was at work. The enemy were not slow in coming back at us, and the grand roar of nearly the whole artillery of both armies burst in on the silence, almost as suddenly as the full notes of an organ would fill a church. The enemy's position seemed to have broken out with guns everywhere and from Round Top to Cemetery Hill was blazing like a volcano. The air seemed full of missiles from every direction." 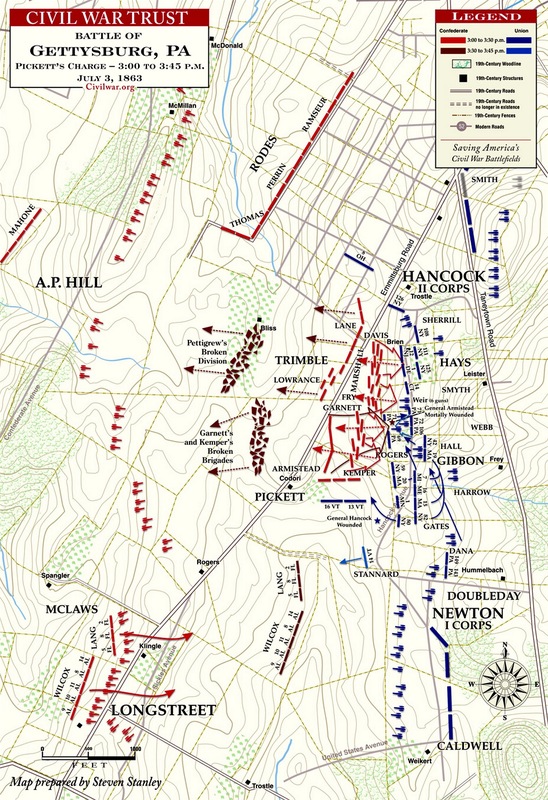 For forty minutes the deadly duel with Union cannoneers on Cemetery Ridge continued with no let up in the volume of shells or ear-splitting blasts. The sound of the cannonade was so loud that it could be heard as far away as Harrisburg, Pennsylvania, a distance of 40 miles. "Up men and to your posts," shouted a joyous General Pickett. "Don't forget today that you are from Old Virginia!" His men cheered as they rushed into formation. "Before us lay bright fields and fair landscape," a Confederate staff officer remembered as the Southern infantry stood in perfect order, prepared to cross the mile of open farmland. At the command of "forward, march!" The huge formations moved and each regiment was distinguishable by the red cloth battle flag of the Army of Northern Virginia. This massive parade was suddenly rained upon by a shower of artillery shells as Union guns came back to life. 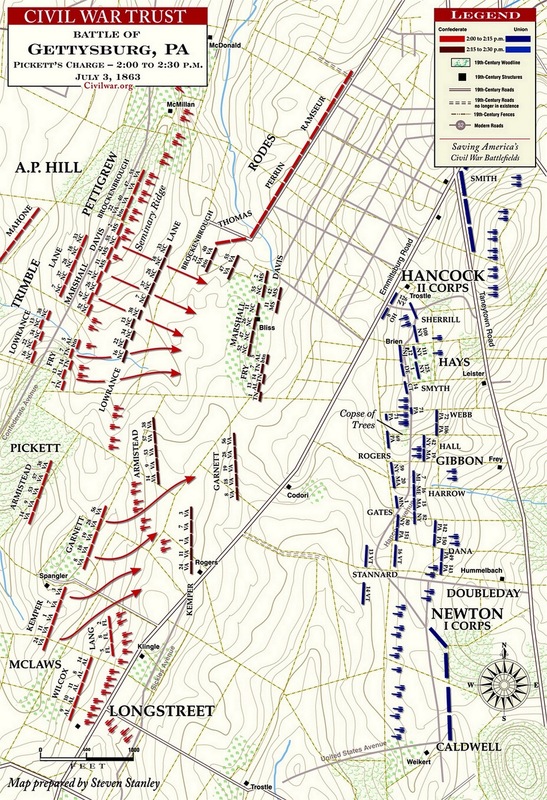 Explosions ripped through the Confederate ranks. Officers waved swords and shouted above the noise for the men to close the gaps. Guided by their flags, the Southerners continued on toward Cemetery Ridge. 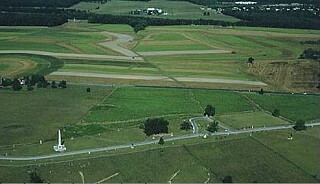 (Right) Photo of the field of Pickett's Charge. 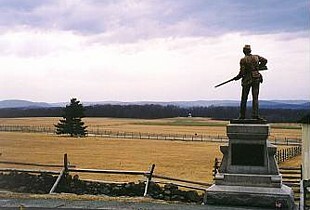 Pickett's, Pettigrew's, and Trimble's commands marched from the distant line of trees to Cemetery Ridge, breaking the Union line at the Angle and "High Water Mark" in the foreground. Today these quiet fields are traversed by hundreds of park visitors eager to walk the same historic line of march where so many tramped to their deaths on that hot July afternoon. 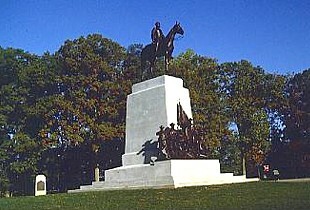 The trail begins at Spangler Woods near the Virginia Monument and takes visitors across the mile of open field, across the Emmitsburg Road and up to the Angle, the central piece of contested ground. Here stands the small grove of trees- a mere clump of scrubby trees and brush in 1863- that forever after has borne the name of the "High Water Mark". Sources: National Park Service; Gettysburg National Military Park; Civil War Trust; National Archives; Library of Congress. Recommended Reading: The Artillery of Gettysburg (Hardcover). 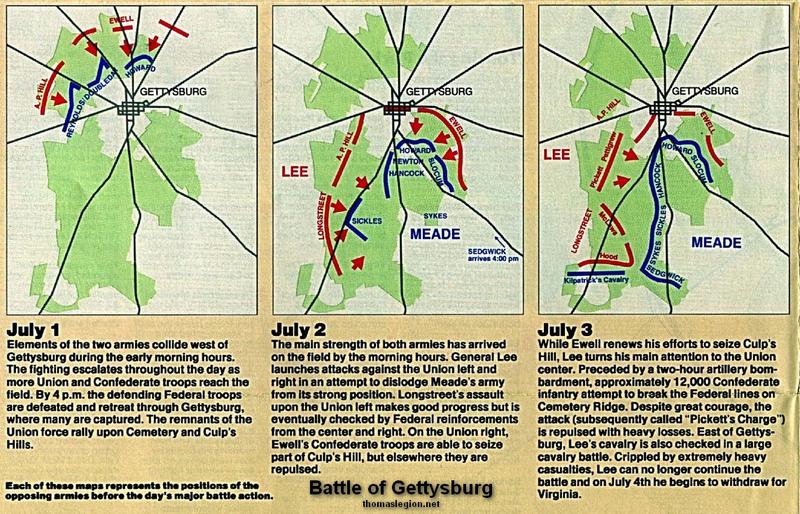 Description: The battle of Gettysburg in July 1863, the apex of the Confederacy's final major invasion of the North, was a devastating defeat that also marked the end of the South's offensive strategy against the North. 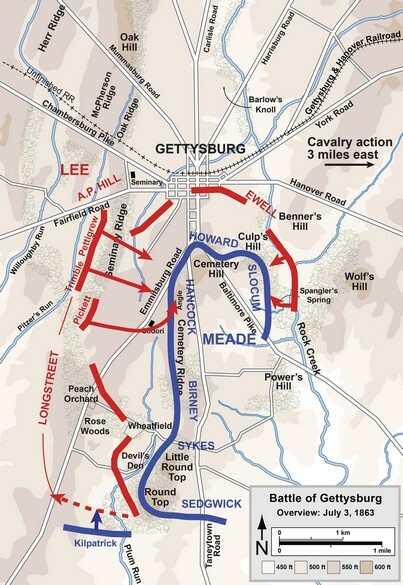 From this battle until the end of the war, the Confederate armies largely remained defensive. The Artillery of Gettysburg is a thought-provoking look at the role of the artillery during the July 1-3, 1863 conflict.